Medieval European law allowed a monarch to claim any land discovered by one of his subjects if it was occupied by non-Christians. 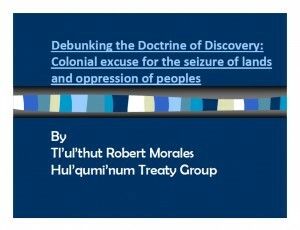 In the 16th century, war against Native Americans was justified on the basis that they were “slaves by nature, uncivilized, barbarian and inhuman.” On January 24, 2012, at the Vancouver Public Library, Robert Morales, chief negotiator for the Hul’qumi’num Treaty Group discussed the continuing effects of this archaic doctrine which even surfaced in a 2012 B.C. Court of Appeal reasoning.